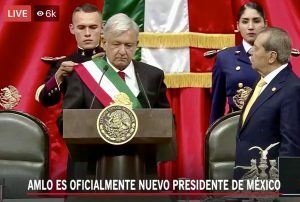 AMLO is the new president of México. He won the presidential chair with more than 53% of the votes, surpassing the multiple candidates of the right-wing political elite as a whole, by more than 14 points. It must also be considered that with just five years of existence, the MORENA party won at least 20,229,314 votes, while the PRI with more than 70 years of existence won 6,157,156 votes, and the PAN with 50 years of political life won 8,131,341 votes. This moment marks an important historical shift for México that lends credibility to the name of Andrés Manuel López Obrador’s presidential coalition: Juntos Haremos Historia– Together We Make History. When we consider the 53% of the votes cast in favor of AMLO, together with the largely favorable results for MORENA senators and representatives (in the Senate MORENA won 52 of 96 seats that were up for election, and in the Chamber of Deputies MORENA won 210 seats of 300), this electoral coalition will soon control not only the executive but also a broad majority of legislative power of the Mexican republic. Under these circumstances, the incoming AMLO government will have nearly absolute institutional power. The published government program states that the priorities of the incoming administration will be focused on attending to the needs of the most vulnerable sectors of Mexican society – the poor, young people, and seniors. The new administration has also announced a dramatic shift in international relations – AMLO subscribes to the philosophy of the self-determination of peoples. This particularly notable with regards to relations with the United States and the issue of migration, since the specific changes have yet to be announced, though a change of direction has been openly declared. Furthermore, the new administration has committed itself to reversing the privatization of water, ending the horrific state sponsored drug war, increasing investment into national infrastructure, etc. In light of the declared goals of the incoming AMLO government, Unión del Barrio now has the obligation to “accompany” the declared cuarta transformación de México– forth transformation of México as AMLO describes this moment. To “accompany” the incoming government is not an unconditional endorsement of AMLO nor MORENA, precisely because the political platform of Juntos Haremos Historiais not anti-imperialist, nor socialist. We know, without the risk of hyperbole or exaggeration, that without those basic ideological tenants guiding a national political movement, there is absolutely no hope for revolutionary change in México. Nonetheless, we must accompany the AMLO government and support its most progressive policies because we recognize that for Unión del Barrio and the masses of the Mexican people on both sides of the border, the new incoming government could eventually lay the foundations for bringing the Mexican people closer to a viable struggle for liberation and socialism. This entry was posted in 2018, Analysis, Analysis, Electoral Politics, En Español, History, History, México, Nuestra América, Organizational Updates, Statement. Bookmark the permalink.